Finally, our second real Jazz review has arrived. Our maestro for this class will be Jimmy Raney, a personal favourite of mine. This concert recording, featuring a more extensive intrument line-up than Barney Kessel's Plays for Lovers, will hopefully give you a more lively impression of the unique atmophere that Jazz creates. 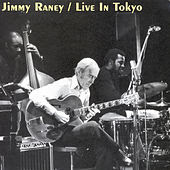 This great live performance offers a nice mix of melodic, romantic songs and more lively, up-tempo tracks masterfully interpreted by Jimmy Raney and his band. Jazz used to be a festive type of music, an aspect which this CD illustrates perfectly. After the pleasant, yet somewhat academic playing on Barney Kessel's compilation, this live recording brings you the 'real thing'. Technically, the recording does a great job of making you feel part of the audience. The band line up includes more instruments, such as a piano, more adventurous drums and a saxophone. Additionally, Jimmy Raney displays his talents both as a reflective, slow and complex chord player and as an up-tempo beepop style player. The two make this concert a great combination of feel-good and moody, laid-back atmosphere. The show starts off, as do a lot of shows in general, with some up-tempo favourites such as How about You and Watch what Happens to get the public going. Always refreshing to hear those few openers. Just goes to show you that you can also use Jazz to get yourself kicking again after an exhausting or depressing day. In Anthropology, Jimmy displays his speed skills. Later on, things slow down and Jimmy gets right into it with a really wonderful version of Autumn Leaves or Les Feuilles mortes as the original title is. You'll also find yet another version of Here's that Rainy Day. Jimmy's interpretation is livelier and grittier; I'm pretty sure most of you wouldn't recognize it without some insider hints. Another notable interpretation on this record is the one of Charlie Parker's classic, Just Friends. Towards the end of the show, the saxophone makes its entry and the band play some more cheerful, croud-pleasing songs. These performances don't require any deep analysis. Just put the CD on, one lazy Sunday afternoon and I'll bet ya, it'll have you tapping your feet or even doing a little dance in no time. They're simply a great example of the uniqueness of Jazz. Jimmy and his band manage to create this jolly, energetic atmosphere, yet maintaining the characteristic laid-back sound of Jazz. It just shows you: you can have lots of fun without even breaking into a sweat. Jimmy is one of the 'old dogs' of Jazz guitar, and also one of my favourites. He has a classic, old fashionned playing style which tends to be punchier, grittier than the more modern players. He's a great example of how real Jazz used to sound. The wonderful thing about him is that he's also excellent at playing the modern, reflective, more complex, slightly intellectual music which I also apreciate. With his background as a classic Jazz guitarist, he manages to pack loads of emotion into the sometimes 'empty' sounding modern compositions, as he does to perfection in one of his last releases, But Beautiful.